Battle evil family-style with Funko Incredibles 2 Mystery Minis! The superhero family shrinks down to pocket-size for the Disney Pixar Incredibles 2. If you are familiar with the Pop! 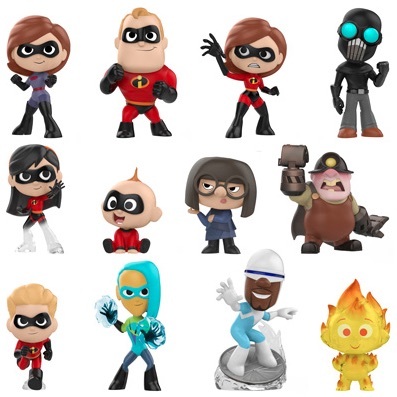 figures for The Incredibles, the Funko Incredibles 2 Mystery Minis figures should not be much of a transition. However, one major difference beyond the sizing is the fact that they are issued in a blind-box format. This means when you purchase the sealed box, you don't know which of the figures you will get. Buy Incredibles 2 Mystery Minis on Entertainment Earth. The entire Incredible clan is featured in the Funko Incredibles 2 Mystery Minis checklist, including Elastigirl in either a red suit or a purple suit. The baby, Jack-Jack, also has multiple versions as the main set adds Fire Jack-Jack. While the primary product found in most places contains 12 figures at even odds of 1:12, there are three figures exclusive to the Target format. 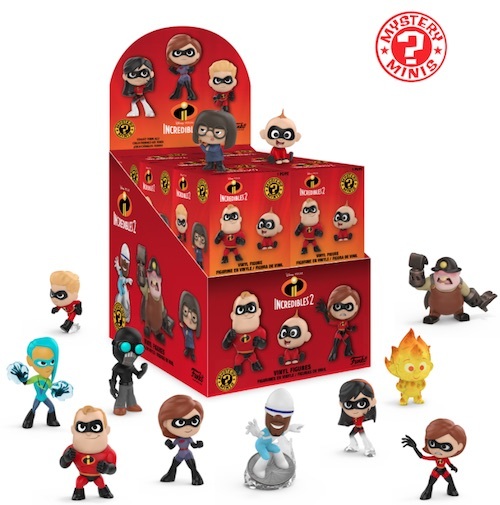 You can only track down Monster Jack-Jack, Raccoon and Reflux in the Target boxes, for a total of 15 figures in the set. Standard figures are all 1:12 boxes. Target odds TBD.